Just in case you are curious about the entire scientific evidence. Here is a video that can give you some idea about Sahaja Yoga Meditation. So let’s define what is meditation or mental silence? First you need to close your eyes in the sitting position with straight back. Second, you need to let go and forgive all thoughts that keep bubbling out of you. Meditation is about letting everything go and forgive anyone, anything come to your mind. Let it be! It is very much like a computer that you don’t touch for some time, the screen saver come up and continue the wait the screen will go off. No matter what you see on the screen saver: Don’t touch that mouse or keyboard, otherwise, you will do it all over again. Just watch that screen saver of your mind going and let it all go. All you do is sit and do nothing. By cutting off visual, hearing, smelling, tasting, movement and finally thinking – magical things happen in your body. It’s like you have a sluggish computer, by shutting down the power and reboot; everything become so fast again! It’s also important to understand what is not meditation. Obviously, thinking is not meditation. You can do thinking with eyes open and you do that all the time. Dreaming is not meditation either. What does meditation do to body scientifically? Meditation decrease our heart rate, breath rate and blood pressure. Isn’t that wonderful? These days people spend a lot of money on drugs just to get lower blood pressure. 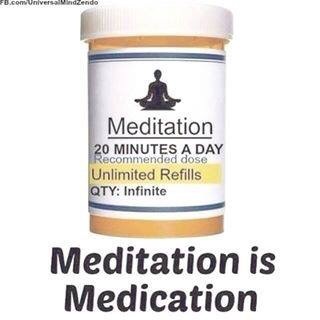 With meditation, it’s all for free. Simply close your eyes! Another science question, what does meditation do to our mind? Meditation balance our fight-or-flight nervous system and enhance our rest-and-digest nervous system. This is the key of getting good sleep, good thinking and good dreams. Meditation also release happy chemicals in our brain. Finally, meditation enhance our immune system. With daily meditation, you will become happier, healthier and feeling more healthy energy! You can connect to a sense of oneness. You can build up your character & EQ. Your flight-or-flight and rest-and-digest nervous systems will become balance. Your will increase your brain capacity by experience more lucid dreams. You will be able to better sustain and improve the world around yourself. You can develop your sense of humor by viewing your experience from 3rd person’s point of view. You can sleep well in the evening with abundant or serotonin. You will feel your energy at higher levels. You will discover your unique talents by opening your subconscious mind. How should anyone start meditation? Begin with a 21 days ten minutes morning meditation challenge. Rain or shine and no matter what. First thing in the morning, get it done! Do you brush your teeth every day? Just do the same thing. In the evening add an optional five to ten minutes foot soaking meditation. Meditation twice daily is the most ideal. So after and before sleep are the best time. Your small investment will give you huge return on your better thinking, sleeping and dreaming. Join a weekly Sahaja meditation group like ours for peer support and new techniques. 1. It’s easier when meditate in a group. 2. It’s free. You don’t pay for your meditation. There are no catches and there are no hidden expenses. 3. You can share your experience with our group and vice versa.